This month Barness and Noble unexpectedly announced the two new tablets namely Nook HD and Nook HD+ let’s we see the features of both these two tablets at below. The Barness and Noble has refreshed their tablet line with the launch of new Nook HD Tablet which has some of the interesting features to read on. It is available in two variants such as 7 inches display and 9 inches display. It is powered with 1.3 Ghz single core processor and it sees 1 Gb of RAM. It features 9 inches full HD display providing a maximum resolution of 1920 x 1090 LCD touchscreen. Its display quality stands at 256 ppi providing sharper and more saturated images. It is very much similar to the Nook HD tablet and it also runs on the Android 4.0 Ice Cream Sandwich Operating System. Nook HD+ is powered with 1.5 Ghz, a little higher than Nook HD tablet and it sees 1 Gb of RAM on boot. This tablet is capable of playing back the full HD videos content on its screen allows to share it on the big HDMI compatible TVs as well. One of the best part of these two tablets is it includes the features of family friendly Nook profiles where in six people can share the device maintaining their separate profile, desktop, background image and customizations. 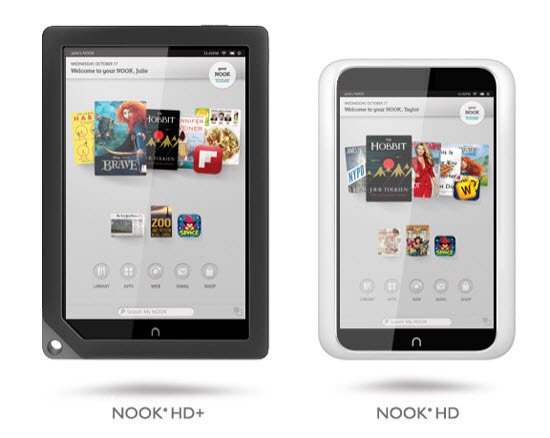 Nook HD will be sold at a price of $ 199 for the 8GB model and Nook HD+ will be available at $269 for 16 GB model.